I’m very pleased to support the expansion of the extremely popular skateboard park at 205 Killarney Avenue. Prior to being elected, I worked to help improve the site between Dalhousie and Acadia Schools, securing funding to upgrade the tot park with a new net play structure, construct an expanded pathway network between the schools, and install the skateboard park. The Sou’Wester has written an accurate overview of how the expansion was initiated. Once the expansion is completed, I will be holding an official opening and commemoration for the community and Chudley-Einarson families. The tragic death of a local skateboard enthusiast has prompted the expansion of a popular Fort Richmond skatepark. Located between Acadia Junior High School and Dalhousie School, the park had been a favoured hangout of Justin Einarson before he moved to British Columbia, said his mother, Dana Chudley. SOU’WESTER: Justin Einarson, pictured here in a photo supplied by his mother, died in 2014 after being hit by a truck while skateboarding. His memory will be honoured with a plaque after the Fort Richmond skateboard park expansion is complete in June. The former Fort Richmond Collegiate student was 17 and living in Coombs, B.C., when he was hit by a truck while skateboarding home from work late one night in July 2014. Grief-stricken friends held a vigil at the Killarney Avenue skatepark and, a few months after his death, joined his family in remembering and celebrating his life during what would have been his 18th birthday. An online fundraising campaign to create a special memorial area in his memory at the park raised over $14,000, far in excess of its original goal of $5,000. The money is being donated to the approximate $90,000 price tag of expansion of the skatepark. The skatepark caught on as a hangout and attraction as soon as it opened in the summer of 2013. 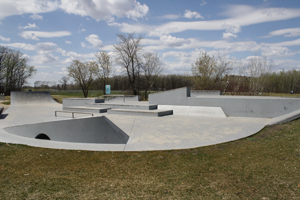 “The city was not planning to expand but quickly recognized the park was a huge hit due to the high numbers of boarders using it,” says South Winnipeg-St. Norbert councillor Janice Lukes. Five extra skateable features are to be added to the park, including half-pipe extensions, rails, a larger bowl and a couple of tricky jumps. They’re intended for the use of the more advanced skaters who have learned on the smaller park, Lukes said. All the components were ordered last fall. “I expect the addition will be up and running (by) late June, pending good construction weather,” Lukes said. A memorial plaque honouring Einarson is expected to be installed for the opening. Lukes is also working on getting the skatepark named for him. Richard Kamchen is a community correspondent for Fort Richmond.